“Honestly, it felt like I got kicked in the stomach,” says 36-year-old Tommy Wolikow shortly after he learned the news of the closing of GM’s Lordstown Ohio plant, which as recently as a few years ago employed up to 5,000 people. “It’s like I got kicked in my stomach. GM has been very, very important to me and my family,” says Wolikow, whose father worked at the plant for 42 years and who met his fiance while working at the plant. On Monday, citing low sales figures on certain models, increased costs due to tariffs, and desire to shift more profitable lower-wage factories overseas, General Motors announced that it was set to permanently close the Lordstown factory, GM”s Hamtramck plant in Detroit and a factory in Oshawa, Ontario. In addition, GM officials announced that they were going to idle two additional facilities – one in Warren, Michigan and another in Baltimore, Maryland. The plant closings, as well as cuts to GM’s white-collar workforce, is expected to eliminate more than 14,000 jobs. The layoffs came despite the fact that GM made $2.5 billion in profits in the third quarter of 2018 and is expected to have one of its most profitable years on record. To many, the decision to close the plant felt like a betrayal after years of UAW members accepting concessions including a two-tier wage system in order to keep the company profitable during the worst days of the recession. “It’s disgusting, my stomach hurts”, says Lordstown factory worker Cheryl Jonesco. “It’s just disgusting”. The plant, which until a few years ago, employed as many as 5,000 people, has long been a driver for the economy in the greater Youngstown-Mahoning Valley region. Just a few months ago, Trump appeared at a campaign event and promised workers that if elected he would help bring back jobs. Trumbull County, where the Lordstown plant is located voted for Obama in 2012 by 23 points, but in 2016 voted for Trump by 6 points; in large part due to the promises of Trump to stop outsourcing, which has decimated. On Monday, Trump told reporters that he spoke to GM CEO Mary Barra about his displeasure with the closings and that he intended to put pressure on the company to keep open the facilities, located in Michigan and Ohio, states that Trump won in 2016. Trump threatened on Tuesday to cut off the $680 million in subsidies that General Motors receives from the federal government. Other groups like Good Jobs Nation, which has been organizing workers for more than a year since layoffs started at the Lordstown facility, also called for cutting off subsidies. “This happens every contract year,” says Sean Crawford, an assembly line worker at GM’s Hamtramck plant. Crawford is one of many younger employees at GM, who work under a two-tier contract agreed to in 2007, that provides younger employees with inferior benefits and wage scales compared to older employees hired before 2007. With GM now profitable, Crawford had hoped that workers could push for the elimination of the two-tier system during 2019 contract talks, but now it appears unlikely that the UAW will have the necessary leverage to push for the total elimination of the two-tier system as the union fights to keep these jobs open. “It’s just GM’s way of sticking it to their unionized workforce, making everybody scared, and softening them up to take concessions,” says Crawford. Despite the potential loss of his job, Crawford is urging his fellow GM workers to resist the urge to make concessions in order to save the plants. Instead, he’s calling on his fellow workers to organize for a strike against GM to fight the closings. 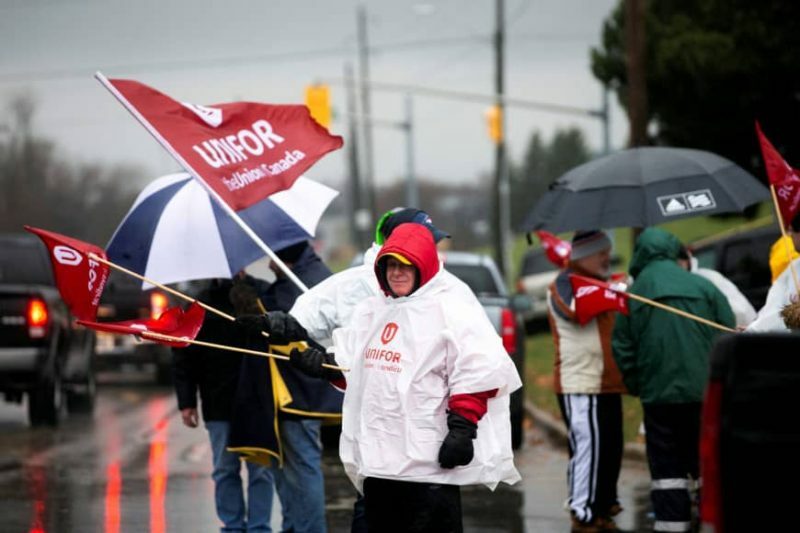 On Monday, workers at GM’s plant in Oshawa, Ontario, represented by Unifor, decided to walk off the job to protest the cuts. The union pledged to engage in more militant actions like Monday’s walkout to protest the proposed closure. 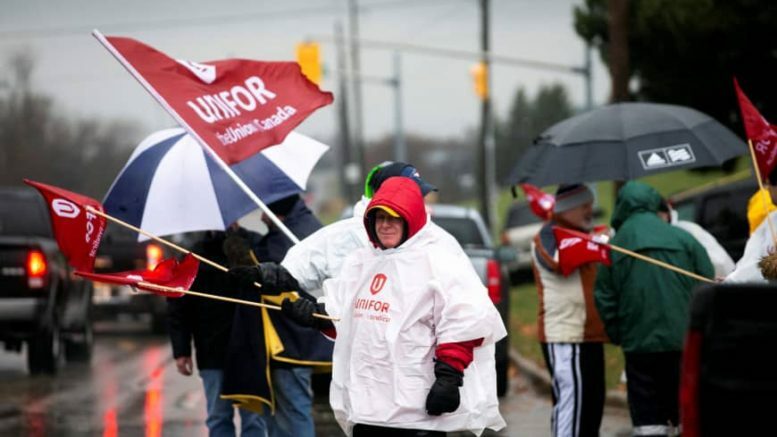 “They are not closing our damn plant without one hell of a fight,” Unifor President Jerry Dias told a crowd of autoworkers at Unifor Local 222’s union hall. Workers in the US hope that the militancy spread to the US as workers remain angry about GM’s sudden betrayal after years of unions accepting concessions to keep them open. “I think this will light a fire under us,” says Cheryl Jonesco. “You just can’t sit back and do nothing and throw your hands up, it’s not an option at all”. Be the first to comment on "GM Workers May Strike Over Plant Closings"